We had a joyous day yesterday in the Archdiocese with the wonderful news from our Holy Father Pope Benedict XVI regarding new Auxiliary Bishops and the arrival of the sacred relic of the heart of St. John Vianney in Boston, here to inspire us and call us to pray for priests and a greater commitment to building a culture of vocations. 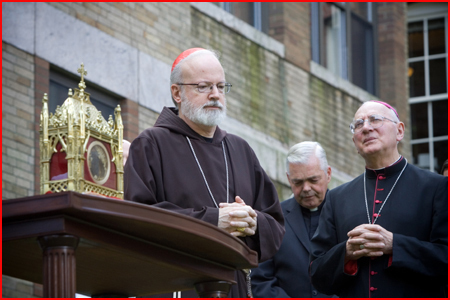 Because Boston is such a large Archdiocese, there are pastoral regions that have been set up and it�s very important for us to have the presence of Auxiliary Bishops in each of these regions to work with priests, vicars, religious, the lay people and deacons. The men who have been named by the Holy Father as Auxiliaries, Bishop-elect John Dooher and Bishops-elect Bob Hennessey, come to us from parishes, which I think is very important, when at this moment in our history we are trying to revitalize our parishes. These are men who have been successful in their parishes – in outreach, in evangelization in having very vibrant faith communities. So I am hopeful that they will be able to encourage the parish communities. They will be visiting the parishes. One of the things that we have done with the Auxiliary Bishops is to set up a schedule of parish visitations with the leadership of each parish � the pastor, priests, deacons, religious education directors, the parish councils, the finance council and principals of the schools. Their presence in the regions is way of extending the ministry of the Archbishop to the different areas of the Archdiocese. These two particular men have vast pastoral experience and have been very successful as pastors. 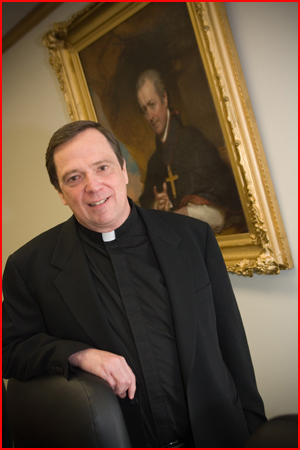 In addition to his work in the spiritual life office, Fr. 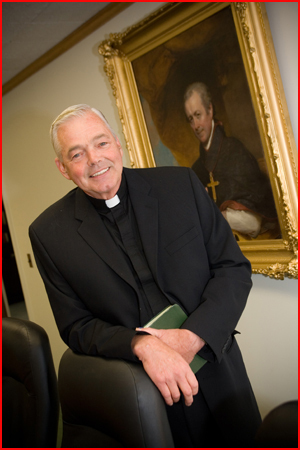 John Dooher has worked with the priest council and the Board of Consultors. Fr. Hennessey has been a missionary, has been working with inner-city communities and with immigrants. 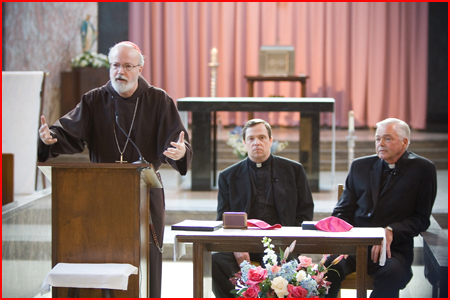 He has also helped on the personnel board, which is a very important function and has helped him to have an understanding � to grasp at what some of our personnel needs our at these times of aging clergy and priest shortage. So I think these two men have very deep lives of faith and enjoy the esteem of their brother priests, religious and the people they serve. I think they are going to enhance the central administration and the regional efforts that are taking place in the Archdiocese. I want to share some pictures with you from yesterday. Fortunately, photographer George Martell was able to join us to capture images of the wonderful day. We shared the wonderful announcement during a press conference in the Peterson Hall Chapel yesterday. Fr. 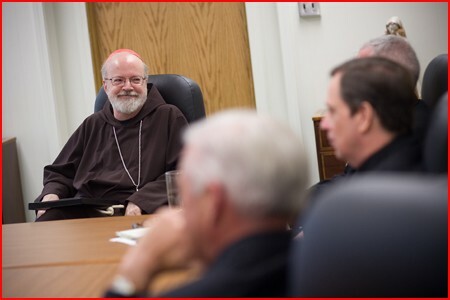 Erikson and I met with the Bishops-elect prior to the press conference. Yesterday was a very auspicious day for us with the announcement of our new Auxiliary Bishops�.it coincided with arrival of the relics of St. John Vianney. It was a wonderful coincidence, at a time when we are trying to encourage people to pray for parish priests and for vocations that the Holy Father would single out two exemplarily parish priests and call them to a higher responsibility for the service of our Archdiocese�.all of this at a time when we are focused on the very special vocation of St. John Vianney, whose life as a parish priest serves as a model for all pastors and parish ministry. The relics that we have here are actually from the body of the saint. 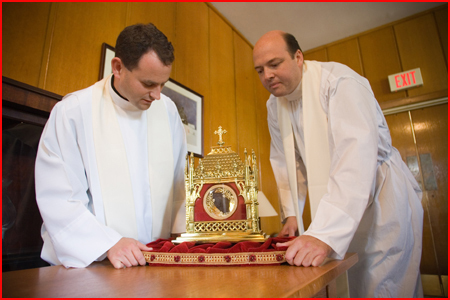 Sometimes you talk about relics that are things that were associated with the saints, that were used by the saints. From the early Church with our belief in the Resurrection, the body is part of who I am. Descartes changed the philosophy of the modern people and gave the impression that we are ghosts in the machine�. �Je pense, donc je suis – I think therefore I am.� But, as human beings, the Church teaches that we are body and soul here, and a body is part of who we are. The deity of the body is underscored by our belief in the Resurrection. This is why we tell people to respect their bodies and why we bury our dead with great reverence because our earthly remains will one day be gloriously raised and reunited with our souls – that�s part of who we are forever. The bodies of the saints underscore our Resurrectional theology. This is a practice that comes from the early Church. I have mentioned previously, the catacombs�the first masses were celebrated on the tombs of the martyrs and therefore we have the custom of having altar stones with martyrs� relics in all of our altars. In virtually all the altars in the Archdiocese, I�m sure there are martyr stones there, usually containing bones or relics of martyrs of the Church. In many important cities the dioceses of Europe really grew up around where a saint was buried. People saw that as a great source of pride for community. The saints were seen as a way of contact with the transcendent�in their lives, the masterpieces of God�s grace become visible for people. So, our devotion to the saints is part of the way the Church holds up heroes and heroines for people to imitate how they live their life of discipleship and sometimes under adverse circumstances. Some of the saints began their lives as great sinners and very far from God�and then had very dramatic conversions that changed their lives, turning from a life of selfishness to a life of service and love. All of that is encouragement to us in our lives as Christians�we are all being called to a life holiness. That takes many different shapes. Pope John Paul II canonized so many saints during his tenure as Pope, more than any of the other Popes previously, precisely because he wanted to underscore the fact that everyone is called to holiness � from all walks of life regardless of whether you are a teacher, a housewife, a scientist, a police officer, or whatever � no matter what your position in life is, you are still called to a life a love and holiness. That is open to everyone. 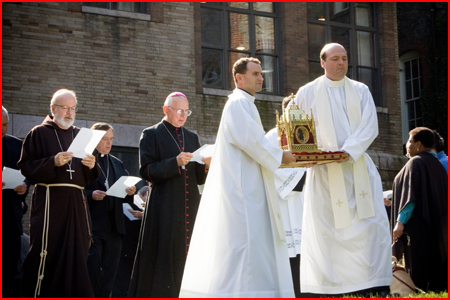 We gathered to receive the sacred relic of St. John Vianney at his statue located outside St. John’s Seminary. Pictured with me above is Bishop Bagnard, Bishop of Belley-Ars, France, who traveled to Boston with the relic. 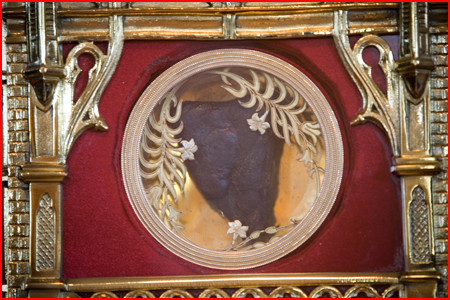 The sacred relic of St. John Vianney. It was very fitting that our Director of Vocations Fr. 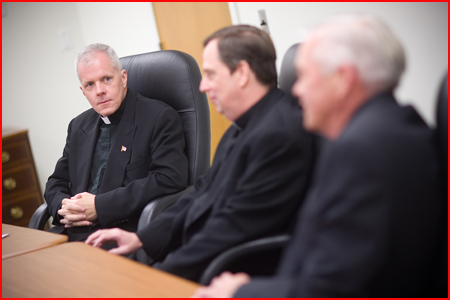 Dan Hennessey (left) and Assistant Director of Vocations Fr. Michael Harrington carried the relic during the procession. 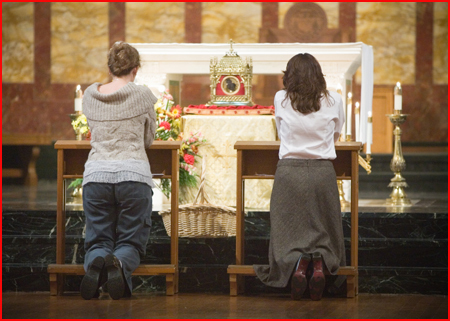 Praying before the sacred relic in the Seminary’s Chapel. 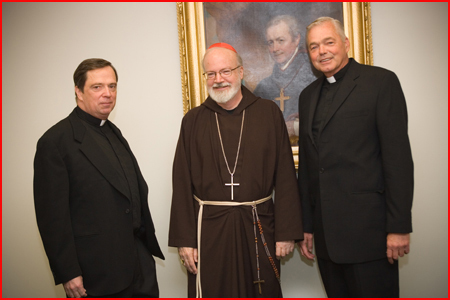 It’s interesting to note that the potrait behind us is the first Bishop of Boston, Bishop John Lefevre Cheverus. He was from France and came with Fr. Matignon to work in Boston at the time of the French Revolution as many priests were expelled at that time from France. He became our first Bishop of Boston in 1808. Of course at that time the Archdiocese of Boston was the �Diocese of Boston��it was all of New England. Bishop Cheverus did a lot of work in Maine with the Indian tribes. He was a very fascinating man and was very beloved in Boston. In fact this painting is one of the Gilbert Stuart portraits � the same artist who created the famous George Washington Lansdowne Portrait from 1796 that I�m sure you may be familiar with. This painting of Bishop Cheverus was commissioned by prominent Protestant families in Boston. Later, Bishop Cheverus was called back to France and became the Archbishop of Bordeaux in 1826 and was later named Cardinal in 1836. So it is very fitting to have this picture of our two new Auxiliary Bishops taken in front of the portrait of Boston�s first Bishop. 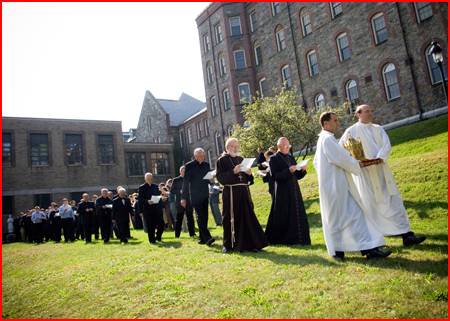 I also wanted to include the schedule for the sacred relic of the heart of St. John Vianney�s visit in Boston. I encourage and invite you to participate if you are able�and if you are not able to participate, I ask that you please pray for parish priests and for vocations. I hope you and your families have a wonderful weekend. Enjoy the beautiful Fall weather here in Boston.